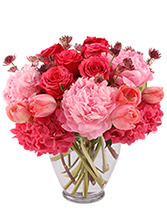 BASHFUL BLISS IS OUR SIGNATURE DESIGN THIS MOTHER'S DAY. 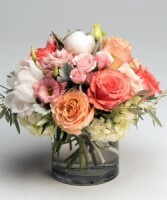 IT INCLUDES A SOFT & INSPIRING MEX OF BLOSSOMS LIKE HYDRANGEA, ROSES, PEONIES, ETC IN A SOFT & FEMININE COLOR SCHEME. 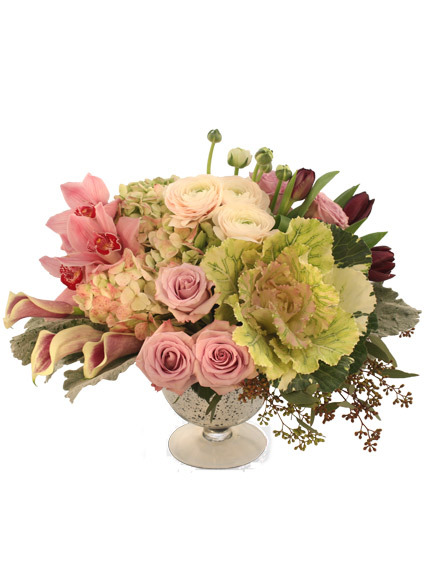 THIS ROSE DESIGN INCLUDES 12 LONG STEM PREMIUM ROSES WITH A LOVELY COLLAR OF HYDRANGEA & FOLIAGES ACCENTS IN A PREMIUM CLEAR GLASS VASE. AS THE PRICE INCREASES THE AMOUNT OF ROSES & HYDRANGEA INCREASE AS WELL. 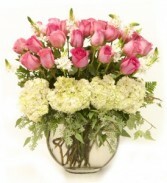 THE AS SHOWN PRICE IS 18 ROSES WITH ABUNDANT USE OF HYDRANGEA.